Hello, my name is John Rogers. I'm a professional sound engineer and have been mixing and mastering at my Las Vegas studio http://JRmastering.com, since 1999. I've worked with over 7,500 highly satisfied customers and mastered over 30,000 songs in every genre and style imaginable. I've worked with several Grammy nominees and winners. I've also mastered many billboard top 10 songs in Europe, movie soundtracks, videos that have appeared on MTV, and dance/EDM music that has been played in dance clubs all around the world. But best of all, I've earned over $100,000 a year mastering songs (online only). If you're not making that kind of money, I believe I can help you sharpen your skills. 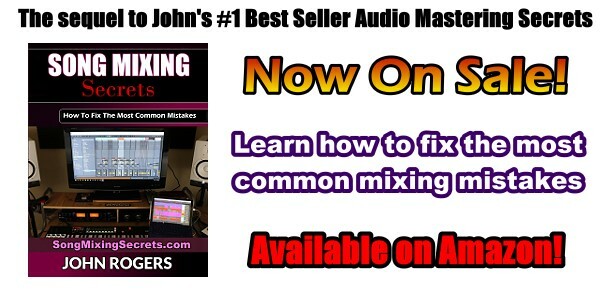 In this book, I teach you everything I know in audio mastering so you can do it too! After receiving thousands of highly favorable email comments from my clients, most not believing what I achieved with their music, I realized I have great audio mastering skills and knowledge that I can pass on to anyone who wants to learn it. Learn in a matter of weeks what took me over 17 long years to learn! Let's get started!